Chennai Super Kings Skipper MS Dhoni was seen sleeping in the Chennai airport after the victory against Kolkata Knight Riders in the Indian Premier League on Tuesday. Former Indian cricket skipper MS Dhoni is one of the most iconic personalities of the sports fraternity and his modest and simple nature is exemplary to all aspiring youngsters. 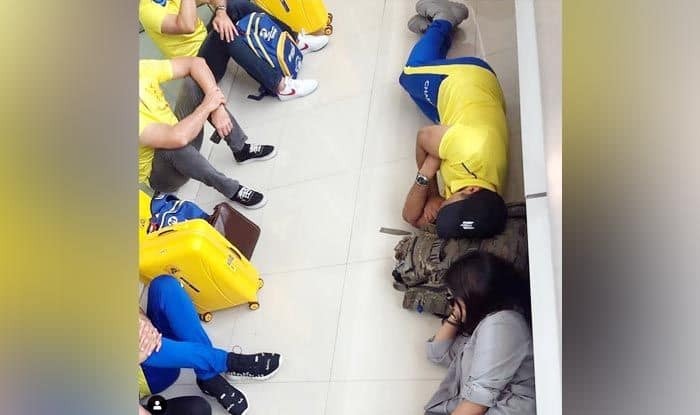 In a recent incident, the Chennai Super Kings captain was seen sleeping on the ground in the Chennai airport right next to his wife Sakshi after the match between Chennai and Kolkata Knight Riders on Tuesday where his side won to take the top of the Indian Premier League (IPL) table. The MS Dhoni-led side delivered a scintillating all-round performance to outclass Dinesh Karthik’s Kolkata side as they defeated them by seven wickets in the match 23 of the IPL at the Chepauk Stadium in Chennai. After their loss, the visitors dropped down to the second position having attained eight points from their six matches played so far. Dhoni also suggested that the tracks at Chepauk needs to improve as batting becomes difficult on it.